Pioneer makes several mini split units with the 12,000 BTU unit being one of them. The Pioneer company is a relatively new name to air conditioning systems and is known for making inexpensive products that compete with name brand companies. Besides the 12000 BTU unit they also make smaller and larger units. 12,000 BTU is a 1 Ton package, most homes have a whole house air conditioner that is 3-5 Ton units. 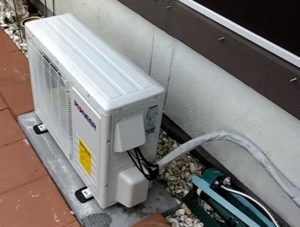 This makes the package smaller than most homes traditional air conditioners but a big improvement over a window air conditioner. 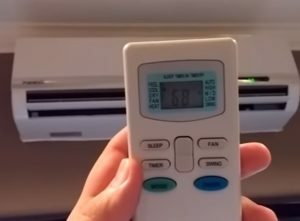 Mini splits are great units to have installed, they are out of the way, quiet, and cheap to run compared to other options. They do cost more than a window package but much cheaper than running duct work and installing a big traditional home HVAC system. The efficiency rating for this unit is 17.5 SEER which is a very good rating. The lowest allowed by law is a 13 SEER unit with many homes built in the 1990s having units with a 8-10 SEER rating. There are units with a better SEER rating if a highly efficient package is needed, of course the price will reflect this. A nice feature about the Pioneer unit is its a heat pump so it both cools in the summer and heats in the winter. Heat pumps work by reversing the refrigerant cycle depending on the temperature and can put out cold or hot air. Besides the price one of the top selling points for Pioneer mini splits is anyone can buy and install them. They are sold in a kit that comes with everything needed for the install besides the wiring. Units are sold online and are shipped straight to your home. I recently installed a Pioneer 12000 BTU 230 Volts which I wrote about and made a video for how to install it. Read Here for the Tutorial on the Install of a Pioneer Ductless Mini Split and Video. While Pioneer is popular with many DIYers someone should be hired if you have no experience with wiring or HVAC in general. The cost for installation can vary depending on your location and the time of year. For example, having a HVAC system installed in the middle of the summer often takes longer and cost more since HVAC technicians are in such high demand during this time. Installation cost usually run between $500-$1000 dollars, again this will vary on location and time of year. If you are a do-it-yourself type of person with some experience with electrical and HVAC than installation should not be a problem. Mini splits require electric to be run to the unit and connected to a breaker. They also require refrigerant lines called a line-set to be run from the outside condenser to the inside evaporator. Running the line-set requires drilling a 2-3 inch hole in the wall for the lines to go through along with control wires. The outside condensing unit will need a solid flat surface to sit on which is usually done with a small cement pad. The inside unit is placed on a wall located in the best place to distribute air. Since mini splits dont dont blow air though ducts strategically locating the unit is a good idea so air can flow into other rooms as much as possible. Ceiling fans are often used to help air distribute about better. Since Pioneer is not a big name in HVAC many wonder if they are a good brand. Personally I have been disappointed by name brand names at times and surprised from companies such as Pioneer. I have installed several Pioneer units and have not had any problems. One install is currently 4 years old and the unit is still working with no problems. Big Brand name companies are no doubt preferred to an unknown brand. If in doubt go with a known name such as Daikin Mini Split or Frigidaire which have been in business for many years. Names such as Pioneer are built for those on a budget and need a low-cost unit to be installed in their home. There are many positive reviews about Pioneer mini split units and it is popular with many people. Be sure to read the reviews on Amazon or elsewhere on any unit before purchasing to be sure it is a good fit for you. Pioneer Mini Split systems are good units and a good fit for those looking for a low-cost solution to cooling and heating a space. Name brand packages are also a good option but the price will reflect it. Pioneer has become very popular with DIyers since it comes as a kit with everything needed for the install. After installing a few Pioneer units for myself, friends, and family they all are still working great. Most people are impressed at how well they work along with low operating cost. While they are low-cost for HVAC units If you plan on hiring someone to do the install it may be best to talk with a HVAC company first to see how much the cost would be. What is the nominal operating gas pressures for cool and heat modes at the low side service port for the Pioneer WYS012GMF122RL system? Label provides design pressure but what is the refrigerant pressure at the low side service port to be? Hope you can answer a question (?) Purchased a unit on Amazon- we need to cut off excess refrigerant lines- the manual has info on making the cut, as well as maximum tubing length; we want to be sure there is no MINIMUM tube length. Having researched several makes of mini Splits, most say 15 feet is min. I have a YMGI installed and the minimum is 15 foot for lines. we have 2 pioneer systems, 18000btu. one upstairs the other downstairs. I am delighted with todays results i.e. Does the outdoor unit compressor run constantly in these despite the outdoor temperature? It seems it never shuts off while the unit is powered on. Had professionally hooked up after DIY installed. It depends on the temperature how much it runs, but they don’t run constantly. Want to know how to leave mini split unit on in our Florida home in summer while we are back in Ohio, without the unit running ALL the time. Any suggestions as to what we should do?